The year 2015 marks the 150th anniversary of the birth of Carl Nielsen, whose musical legacy remains of huge cultural importance both in Denmark and across the globe. 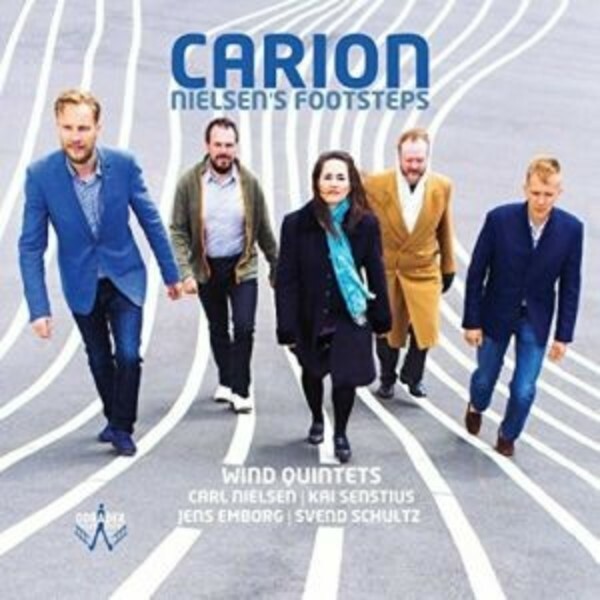 This disc, performed by Carion, features Nielsen’s Wind Quintet, alongside three world premiere recordings of wind quintets written by composers who were influenced by the Danish composer. Nielsen’s Wind Quintet is one of his finest and most innovative pieces. Nielsen abandons the traditional structure of melody and accompaniment for a more balanced, experimental style, exploring the rich sonorities of wind instruments in different combinations. This release also includes a bonus DVD recording of the Nielsen Wind Quintet. These different groupings inspired the musicians of Carion to take an original approach when recording the piece. As with many of their live performances, the musicians played with the physical space suggested by the music, moving forward during a more prominent passage to create an intimate sound, stepping back when accompanying, or lining up in a row to form a sonorous chorale. The result is a fascinating and unique interpretation of this repertoire. The three world premiere recordings consist of the quirky yet lyrical ‘Une amourette’ (1943) by Svend S Schultz, whose centenary was celebrated in 2013; Jens Laursøn Emborg’s colourful and varied Wind Quintet (1931), and the imaginative, enthralling Wind Quintet (1934) by Kai Senstius.